Let’s move on to Water Main / Azure Fang guide. You can choose Azure Fang as your main character if you’re looking for good CC and Healing at early game. If you ask me, I would resort Water Main for Mid and Late game as the CC control, Poisoning and Healing really helps the entire team. The healing mystery used by Water Main also helps to remove Debuffs which will be extremely helpful in later stages of game. As you won’t encounter high Debuff causing team in early stages, I would suggest you to choose other Main characters if you want to have an aggressive start. But it all depends on your objective, if you think Azure Fang is a suitable main character to choose and build your team around her, go for it. Like all the other main characters, Water main have five talents in Naruto Online game. Water Main has 4 offensive damage inflicting mystery skills and one overpowered healing skill. At the beginning of the game, you may want to use Water main for offensive purpose as you will be lack of ninja characters with high damage output. It would be great to use offensive mysteries until you get some rare or super rare ninja characters. The first mystery, Water Style Poison Fog will be useful for you until you unlock the 2nd mystery skill. The 2nd Mystery skill, Water Style Super Shark Bomb deals a great AOE damage. If you have your Neurotoxin passive skill activated, you have high possibilities to cause chaos to your opponent units. The Regenerative Jutsu will be useful in the mid and late game when you use Water Main purely for healing and Debuffs removal. I’ve never tried using Skewering before for Water Main. However, if you’re against a team with strong shield and buffs, this mystery might help you removing the shields and buffs for a particular unit. It is best to use Regenerative Healing Jutsu as your main mystery skill during the mid and late game and support your whole team. You have to resort with the Taijutsu Attack till you reach level 35 where your Healing Jutsu gets unlocked. At early stages, as mentioned earlier you will be lacking in huge damage inflicting ninja characters. Until you reach level 50 and above it is better to use offensive standard attacks with Azure Fang, unless you manage to obtain super rare ninjas where you can use her to support those ninja characters. The third standard attack is pretty good as it has a great chance of causing Acupuncture that disables the ability of the opponent’s unit to use mystery skill. Monster Strength is a good offensive standard attack. If you choose to go offensive with Water Main even after level 65, Monster Strength can be a good standard attack. However, make sure the standard attack that you choose can work well with your chase skills and summon for consecutive combos with other ninja characters in your team. Chase skills of Water Main is pretty impressive. My favorite chase skill will be Chakra Dissection Blade. Let me tell you why. Chakra Dissection will give guaranteed Critical Hit. When your passive skill, Neurotoxin is combined with this chase skill, you will definitely cause chaos to your opponent’s unit. If you want to go on with AOE damaging chase skill, you can use Water Style – Water Trumpet which will damage 2 units of the opponent’s units. But, you need at least 10 COMBO to trigger this chase and it is hard to continue higher COMBO. Chase skills are important in maximizing your team’s combo hits. Just make sure to choose the right chase skills that suits your team. When you’re using a Water team which includes other water attribute ninjas, the first passive skill will be a good selection. It will increase the Ninjutsu and Attacks of 3 Water attribute units in the Lineup which lasts for 5 rounds. Only use this passive skills if you’re using Water attribute ninjas. Neurotoxin is one of the best offensive passive skills which will cause Chaos to opponent’s unit when the opponent’s unit is hit by Critical Hit. It is a good combination with Chakra Dissection Blade due to the guaranteed Critical Hit. If you want to go full out with healing team, Healing Tips is a good passive skill to choose. For example, you have Water Main using Healing skills with other healing ninja characters, it will increase the healing effects by 40% which provides great support for your entire team. I never tried using Natural Energy Gathering passive skill before. It will be a good passive skill if you want to spam you mystery every round or have ninja character like Tenten (Great Ninja War) in your team. But, you also need to get your Experimental Jutsu in play for the Natural Energy Gathering to produce great effect. The 2nd tier of passive skill provides great utility for Water Main. The only passive skill I’m intrigued about is the Poison Tai. The poison stacking passive skill that gets your opponent team annoyed. However, to make this passive skill extremely outrageous is by using AOE Taijutsu damaging characters like Sailor Sakura and Roshi [Four-Tails Jinchuriki]. I’m not a fan of other passive skills in the 2nd tier. You may want to try other passive skills and see how it works with your team. The 3rd passive skill, Experimental Jutsu might be useful to spam consecutive Mystery Skills if you combine it with Natural Energy Gathering. Like other guides, I will provide the basic Water Main team build for you to sustain early and middle game. If you manage to get super rare ninjas, please use them in your lineup and setup your talents according to those ninjas to make them powerful. This is the most simple and basic team build for Water Main/ Azure Fang. You can easily get all the ninjas even if you’re F2P player. For this lineup you need the basic ninjas; Sasuke(Elite Instances), Hinata(Rank Battle Shop & Elite Instances), Karin (Group Shop). As for the summon you can use Ninja Monkey ( you can get it from Forest of Land of Waves). This team build will be extremely useful till level 60-65. 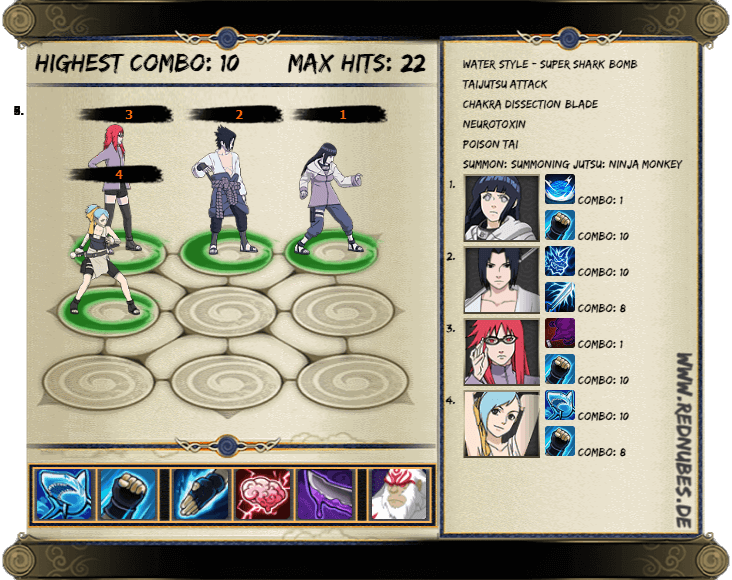 As you can see on the screenshot above, most of the ninja characters can do minimum 8 combo with their standard attack and mysteries and you can maximize it to 10 combo. What do you think of this Water Main/Azure Fang guide? Please share your thoughts by commenting below.